Earlier today I was introduced to this hallway of boxes, the contents of which will occupy me for the next several months. Everything inside of them once belonged to the Rev. Dr. Roger Shinn, alumnus and professor emeritus at Union Theological Seminary. It will be my task to process Shinn’s papers, sorting and cataloging and eventually reorganizing them into different boxes so that they can be easily accessed in the Burke archives. As I process these materials I will be learning on the job. I am a doctoral student in Hebrew Bible, not an archivist. My first experience with archival materials was this past semester, when I was one of several student curators for a rotating display called #LoveInAction highlighting the legacy of student activism at Union. I worked with two different student-driven initiatives from the 1960’s, the Student Interracial Ministry and the Free University. Thanks to several dissertations and books written about the period, I entered the project with a good basic understanding of the events and characters involved in both. 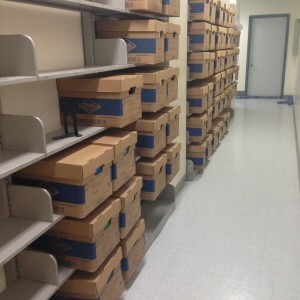 Working with the archives, however, allowed me a different kind of access. I read student publications, seeing not only the articles related to my project but also skimming headlines that gave me a broader sense of the campus environment of the time. I saw drafts of press releases with handwritten corrections or notes and letters between people that were sometimes formal, and other times blunt or humorous. It was while I was sifting through these materials that I first encountered Roger Shinn’s name. As a member of the faculty at Union, he had written an article in support of the Student Interracial Ministry. It was a compelling article, explaining to those outside of the endeavor what it was and why he considered it such a vital contribution to the theological and moral demands of the times. His voice came across as a powerful advocate of student activism, who understood how entwined his students’ passions were with their theological education at Union. I remember thinking at the time that he sounded like the kind of professor I would hope to be one day. Now I have all of these boxes filled with his papers, and I look forward to getting to know him better as I work through them in the coming months. The vague labels on the boxes are intriguing – “Theater,” “WWII Papers,” “Genome,” “UCC Conferences,” “Tillich, Niebuhr ‘thought of.’” In the coming months, I will not only know what these boxes contain, but will get to be a part of the process of making their contents accessible to others. At the moment, I have little sense of how this hallway of boxes becomes part of the archives. This entry was posted in Archives, Student Entry on June 19, 2015 by Carolyn Klaasen.